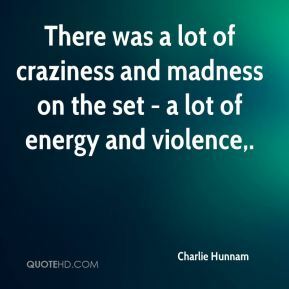 There was a lot of craziness and madness on the set - a lot of energy and violence. March Madness ranks number one for us. It is, by far, the busiest event we have online throughout the year. 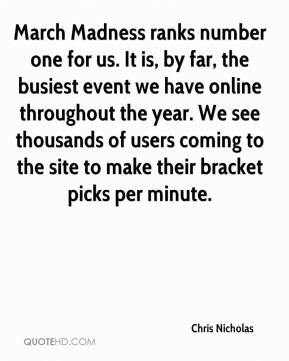 We see thousands of users coming to the site to make their bracket picks per minute. 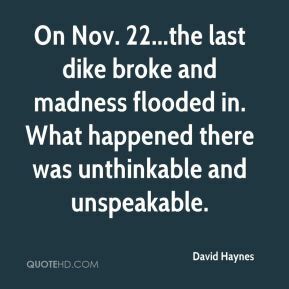 On Nov. 22...the last dike broke and madness flooded in. 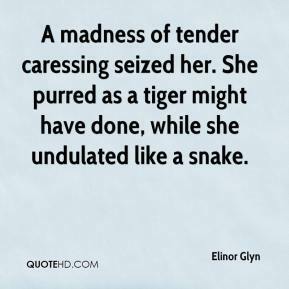 What happened there was unthinkable and unspeakable. 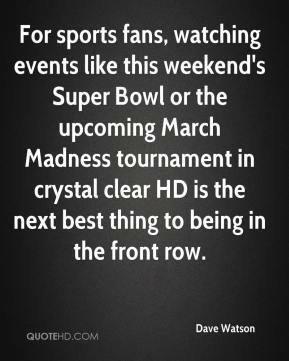 For sports fans, watching events like this weekend's Super Bowl or the upcoming March Madness tournament in crystal clear HD is the next best thing to being in the front row. There will be some confusion. 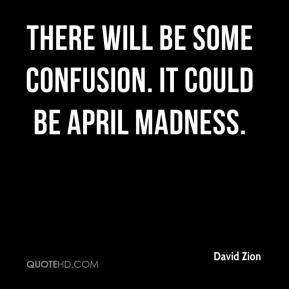 It could be April Madness. 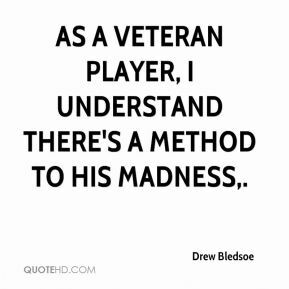 As a veteran player, I understand there's a method to his madness. 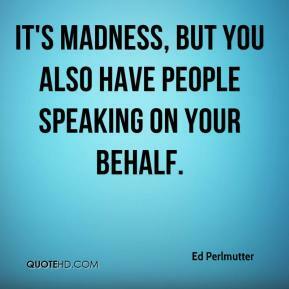 It's madness, but you also have people speaking on your behalf. 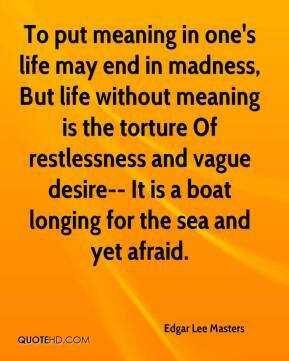 To put meaning in one's life may end in madness, But life without meaning is the torture Of restlessness and vague desire-- It is a boat longing for the sea and yet afraid. 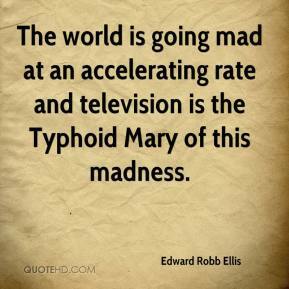 The world is going mad at an accelerating rate and television is the Typhoid Mary of this madness. 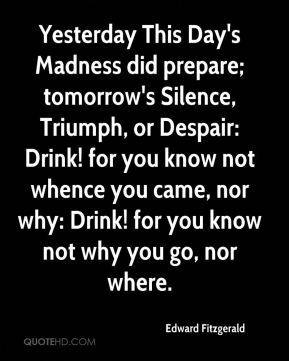 Yesterday This Day's Madness did prepare; tomorrow's Silence, Triumph, or Despair: Drink! for you know not whence you came, nor why: Drink! for you know not why you go, nor where. I believe that all the survivors are mad. 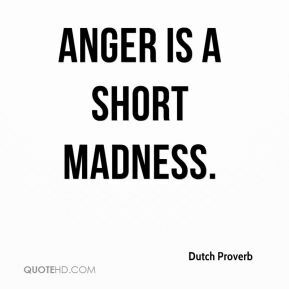 One time or another their madness will explode. 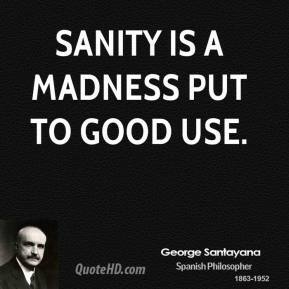 You cannot absorb that much madness and not be influenced by it. 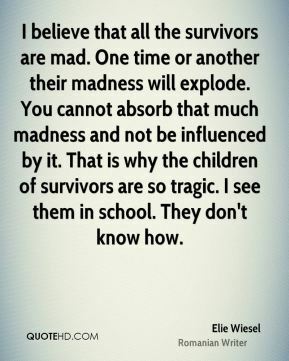 That is why the children of survivors are so tragic. I see them in school. They don't know how. 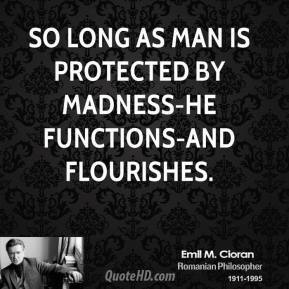 So long as man is protected by madness-he functions-and flourishes. Fans were chanting my name. 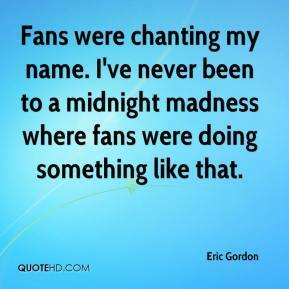 I've never been to a midnight madness where fans were doing something like that. This is definitely March Madness. 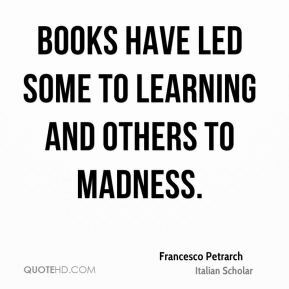 There's madness all over the place. 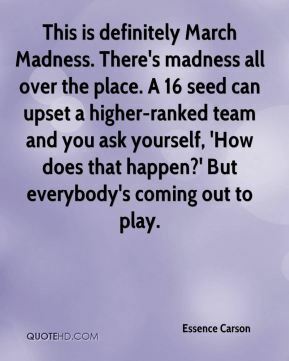 A 16 seed can upset a higher-ranked team and you ask yourself, 'How does that happen?' But everybody's coming out to play. There have been a lot of upsets, that's been the talk of this year. It's not called March Madness for nothing. Every game is a threat no matter what team it is or what conference you come from. 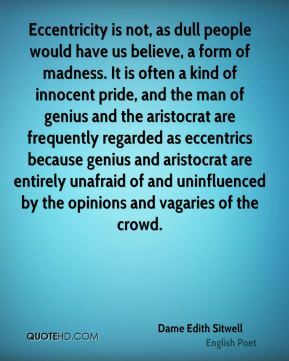 Our concerns are ourselves. We're pretty much the only team that can beat ourselves. 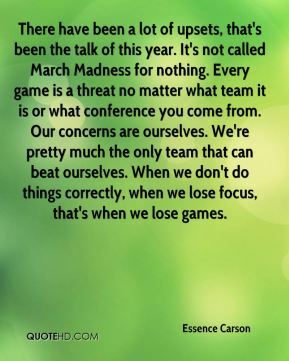 When we don't do things correctly, when we lose focus, that's when we lose games. 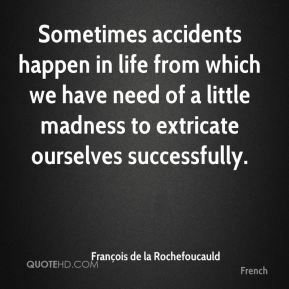 Sometimes accidents happen in life from which we have need of a little madness to extricate ourselves successfully. 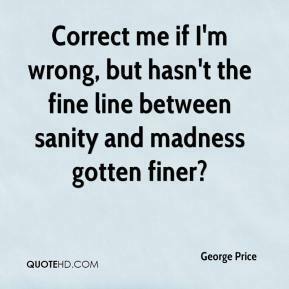 There is a degree of madness about it. 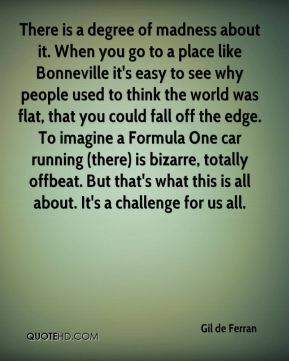 When you go to a place like Bonneville it's easy to see why people used to think the world was flat, that you could fall off the edge. To imagine a Formula One car running (there) is bizarre, totally offbeat. But that's what this is all about. It's a challenge for us all. 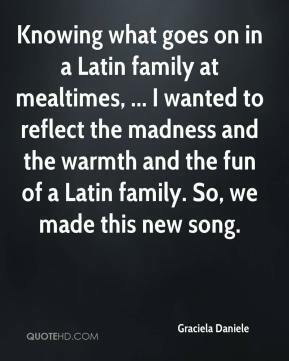 Knowing what goes on in a Latin family at mealtimes, ... I wanted to reflect the madness and the warmth and the fun of a Latin family. So, we made this new song. 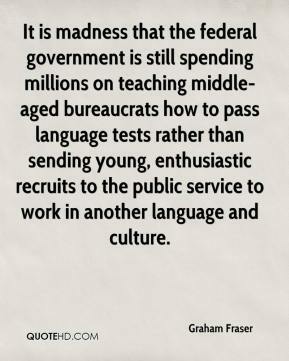 It is madness that the federal government is still spending millions on teaching middle-aged bureaucrats how to pass language tests rather than sending young, enthusiastic recruits to the public service to work in another language and culture.